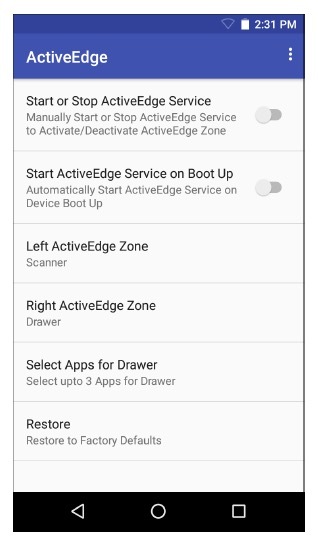 Zebra ActiveEdge Touch Zone provides a customizable "App Drawer" that gives users a quick and easy way to launch an organizations's apps or functions from inside any other app or task. A customizable drawer (shown above) can hold as many as three launching icons, giving workers convenient one-touch access to workflow or line-of-business apps. A second drawer accessed from the opposite edge of the screen can hold an additional app, launch an intent or be configured to perform other tasks. ActiveEdge tray icons are easily configured on the device through a settings panel (above) or deployed throughout an enterprise by pushing an XML file. If ActiveEdge is not present on a device, an OS Update might be required.